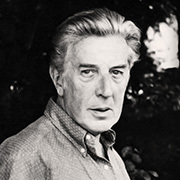 Sir Frederick Ashton CBE was a British ballet dancer and founding choreographer of the Royal Ballet. He also worked as a director and choreographer in opera, film and revue. Determined to be a dancer, despite the opposition of his conventional middle-class family, Ashton was accepted as a pupil by Léonide Massine and then by Marie Rambert. In 1926 Rambert encouraged him to try his hand at choreography with ‘A Tragedy of Fashion’ and though he continued to dance professionally, it was as a choreographer that he became famous. In 1928 when Ashton joined the Ida Rubinstein Company in Paris, he was able to perfect his craft by apprenticing himself to Bronislava Nijinska, who taught him how to personalize the language of classical ballet and make it relevant to his time. Ashton was chief choreographer to Ninette de Valois, from 1935 until her retirement in 1963, in the company known successively as the Vic-Wells Ballet, the Sadler’s Wells Ballet and the Royal Ballet. He succeeded de Valois as director of the company, serving until his own retirement in 1970. Ashton is widely credited with the creation of a specifically English genre of ballet. Among his best-known works are ‘Façade’ (1931), ‘Symphonic Variations’ (1946), ‘Cinderella’ (1948), ‘La fille mal gardée’ (1960), ‘Monotones’ I and II (1965), ‘Enigma Variations’ (1968) and the feature film ballet ‘The Tales of Beatrix Potter’ (1970).